the time it takes to develop a great site? maintaining a site rather than being focused on the important things? too many questions on how to create the perfect site? sorting through where to host your site? building a site that is attractive & easy to use? being concerned about the cost of building & maintaining a website? worrying your site may not be secure? building a solid eCommerce site? Plans with peace of mind and ease of use so you can focus on the important things. We want to make sure you’re 100% happy & over the moon with your site. 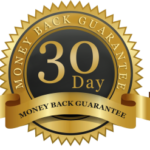 So for extra peace of mind, we offer a 30 DAY MONEY BACK GUARANTEE on your initial start up cost. After 30 days, cancel anytime. Now that’s RISK FREE! No problem. We’d love to talk it over with you. "Skyrocket Design Lab is a crucial part of my business. Simply put, they get what we do and have built our online experience around that. It's nice to know someone is in your corner ever step of the way".